Description: Space scoop, news for children. Today’s we bring you a double feature, discussing Hubble’s eye on the sky and our search for worlds orbiting other stars. When a massive star comes to the end of its life it doesn’t quietly burn out like a dying candle. Instead, it goes out with a bang, or rather an explosion that outshines almost everything else in the Universe! This explosion is called a supernova, and when this happens, the star is torn apart, throwing material into space. But something is left behind — a ‘neutron star’ — the remaining core of a massive star once it has exploded. This picture might look like a jawbreaker that’s been dipped in dental floss, but it actually shows an artist’s impression of a very exotic type of neutron star called a “magnetar”. Magnetars are some of the most extreme objects known in the Universe. 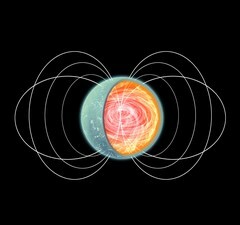 They are a very small and ultra-compact type of neutron star that erupt randomly with bursts of powerful high-energy flares. These stars were given their name because they are very strong magnets. You’ve probably played with magnets in school and know that magnets attract materials like iron. Magnetars are notoriously strong magnets – the strongest in the entire Universe, in fact! Well, except for this one. This picture shows “SGR 0418”, a magnetar that doesn’t fit the mould. It is a much weaker magnet than any other star of its kind. What makes this really puzzling is that it raises the question: where does the energy come from to power its dramatic high-energy flares? Until now astronomers thought the strong magnets powered the flares . But this theory doesn’t work for SGR 0418! This star appears to be an oddity amongst oddities! Cool Fact: Guess what? The Earth is a giant magnet, too! Although nowhere near as strong as a magnetar, it is still strong enough to protects us from harmful radiation sent from the Sun, and it causes the beautiful Northern Lights!